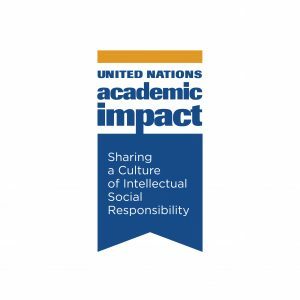 The United Nations Academic Impact (UNAI) is an initiative that aligns institutions of higher education with the United Nations in supporting and contributing to the realization of its goals and mandates. This includes the promotion and protection of human rights, access to education, sustainability and conflict resolution. Since 2010, UNAI has created a vibrant and diverse network of students, academics, scientists, researchers, think tanks, institutions of higher education, continuing education and educational associations. There are over 1000 member institutions in more than 120 countries that reach millions of people in the education and research sectors around the world. Since its inception some thirty international networks of universities and other institutes of higher education and research have endorsed UNAI and encouraged their members to join, representing a global diversity of regions and a thematic wealth of disciplines. Intercultural Dialogue – A commitment to promoting intercultural dialogue and understanding, and the “unlearning” of intolerance, through education. United Nations Charter – A commitment to the principles inherent in the United Nations Charter. Lalaji Memorial Omega International School is the only school to be among the network of UNAI members.